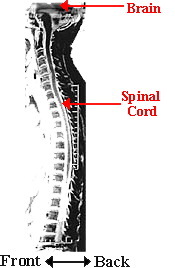 The spinal cord is the main pathway for information connecting the brain and peripheral nervous system.The human spinal cord is protected by the bony spinal column shown to the left. The spinal column is made up of bones called vertebrae. Although the spinal column is somewhat flexible, some of the vertebrae in the lower parts of the spinal column become fused. The spinal cord is located in the vertebral foramen and is made up of 31 segments: 8 cervical, 12 thoracic, 5 lumbar, 5 sacral and 1 coccygeal. A pair of spinal nerves leaves each segment of the spinal cord. The length of the spinal cord is about 45 cm in men and 43 cm in women. The spinal cord is shorter than the length of the bony spinal column; the spinal cord extends down only to the last of the thoracic vertebrae. Nerves that extend from the spinal cord from the lumbar and sacral levels must run in the vertebral canal for a distance before they leave the vertebral column. This collection of nerves in the vertebral canal is called the cauda equina (which means “horse tail”). Receptors in the skin send information to the spinal cord through the spinal nerves. The cell bodies for these nerve fibers are located in the dorsal root ganglion. The nerve fibers enter the spinal cord through the dorsal root. Some fibers make synapses with other neurons in the dorsal horn, while others continue up to the brain. Many cell bodies in the ventral horn of the spinal cord send axons through the ventral root to muscles to control movement. In the figures below, note the differences in the shape and size of the spinal cord at different levels. The dark gray color in each segment represents “gray matter.” If you use your imagination, you can see that the gray matter looks similar to an H or a butterfly. Nerve cell bodies are located in the gray matter. Surrounding the gray matter is white matter (lighter color shading) – this is where the axons of the spinal cord are located. Compare the relative amount of gray and white matter at each level of the spinal cord. In the cervical segment, there is a relatively large amount of white matter. This pattern is caused by the many axons going up to the brain from all levels of the spinal cord AND there are many axons traveling from the brain down to different segments of the spinal cord. In lower segments of the spinal cord, there is less white matter because there are fewer axons traveling to and from the brain.There are also differences in the gray matter. In the cervical segment, the ventral horn (the lower half of the segment) is enlarged. Also in the lumbar segment that is illustrated, the ventral horn is large. These segments are those that contain motor neurons that control movement of the arms (cervical segment) and legs (lumbar segment). 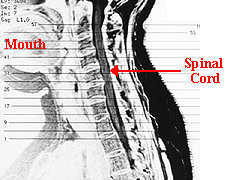 Previous articleWhat Is A Spinal Cord Disorder Or Disease?